In October 1991, Cambodia began to climb out of the nightmare years of the Khmer Rouge regime. This move to democracy created an opening for the gospel to come into Cambodia, with new freedom to preach and teach the Bible. With this new freedom came foreigners—many as missionaries and leaders of Christian NGOs. We began an era of strong growth. From 1993 to 1997, the Church in Cambodia grew from 45 to 4,500 churches. This growth bred confidence, especially amongst some of our foreign friends. They taught us that we could trust God in all situations—that God would protect us, provide for us, and free us from worry. This teaching was hard to accept at first. We had just come through a period of mass slaughter and horror known as The Killing Fields, when millions of Cambodians were murdered for “disloyalty” to the Communist regime, for being educated, or simply for being in the wrong place at the wrong time. How should we reconcile our recent experience with this new, confident teaching? We did our best to absorb the confidence that radiated from our foreign teachers—that is, until July 1997, when war broke out between rival political factions in the new, democratic Cambodia. We then watched in astonishment as our foreign friends fled—to Thailand, Malaysia, Singapore, and elsewhere. We Cambodian Christians were left to fend for ourselves. This experience taught me that when it comes to understanding what it means to be a Christian leader, we should not look to fallible human beings. There is one Person to whom we should look—Jesus. WE ARE IN AN ERA in which Christian leadership development is quite popular. There are many training programs and perspectives being presented. Many of these programs emphasize contextualization—that we apply cultural and other factors to our understanding of Christian leadership. 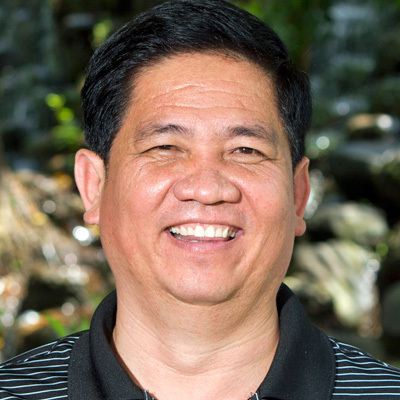 MENG AUN HOUR is founder and senior pastor of Followers of Jesus Church in Phnom Penh, Cambodia, as well as president of United Pastors Fellowship. He also serves as national director for Asian Access Cambodia. He, his wife Rady, and their daughter Vouchly live in Phnom Penh.